This post is sponsored by KRAFT and Philadelphia Cream Cheese. Is anyone else melting this summer? Like the ice cream in this cheesecake↑↑?! I’m literally melting over here…we are trying to avoid turning the ancient A/C unit on in our house and it might be the death of me. 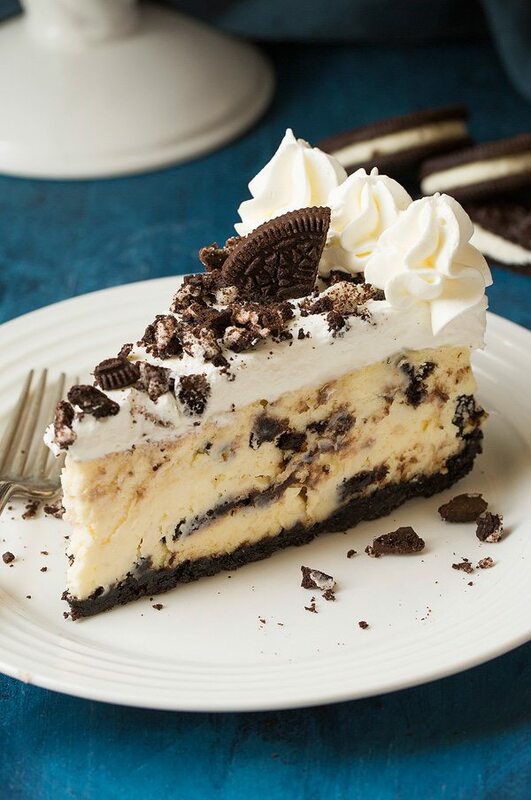 And yes, you heard me–there’s Cookies n Cream ice cream in this cheesecake. It’s a layer of ice cream over a frozen layer of chocolate cheesecake. In an oreo cookie crust:) With gobs of chocolate drizzled over the top. I know, I know. I’m all googly eyed too. It’s rich and decadent and perfectly summery. And super naughty. Just the way you want to consume your calories on a hot summer day. Right??? Today is after all, National Cheesecake Day, so we must celebrate and indulge! Start by making a really simple Oreo cookie crust (crushed Oreos + melted butter) and press it into a spring form pan. The chocolate cheesecake layer is a basic chocolate cheesecake- cream cheese, eggs, a little sugar, cocoa, vanilla, and I like to add a little bit of Mocha coffee creamer, amaretto, or even just plain whipping cream. Gives it a little flavor boost and makes it extra creamy. And I always, always use Philadelphia Cream Cheese for my cheesecakes, it’s just the best because it’s made with fresh local milk and real wholesome cream, making my cheesecakes rich and delicious! Pour the chocolate cheesecake into the spring form pan and bake for 30-40 minutes (and make sure to read the additional baking tip in the directions)! Set in the fridge to cool. Then, have a little a slice of heaven. And don’t forget to drench it with more chocolate!! a layer of cookies n cream ice cream on top of a frozen layer of chocolate cheesecake! the perfect decadent cheesecake for summer! Lightly grease a round spring form pan. Combine crushed oreos and melted butter. Press into the spring form pan and about 1/4-1/2 inch up the sides of the pan. Place in the fridge. In a stand mixer, beat cream cheese until smooth and there are no lumps. Beat in eggs, sugar, and cocoa until creamy. Lastly beat in creamer (or whipping cream) and vanilla. Pour into oreo cookie crust and bake at 325 for about 40 minutes. It shouldn't be completely set yet. Turn off the oven, open the oven door and let the cheesecake continue to bake in the cooling oven for 20-30 minutes or until set. Remove from oven and let cool completely in the fridge. Scoop ice cream into a large bowl and stir together until softened. Spread over the chilled cheescake in an even layer. Place in the freezer until ice cream has firmed up again or ready to serve. serve with a drizzle of chocolate sauce! This looks delicious! Just wondered – what size springform pan should be used? I have a couple different sizes. Thanks! I thought when I mixed up the 14 cookies and 1/3 cup melted butter it looked like too much butter and not enough cookie. I went ahead however and put it in the springform pan. When I later added the cheesecake mixture and put it in the oven. Quickly the butter dripped out of the pan and smoked up the oven. Turned exhaust fans and let it cook. Big mess in oven but am hoping it will still taste good. Next time I will use less butter and more cookies. Oh no! so sorry it didn’t work for you and you had a mess. Hopefully it still tasted okay?